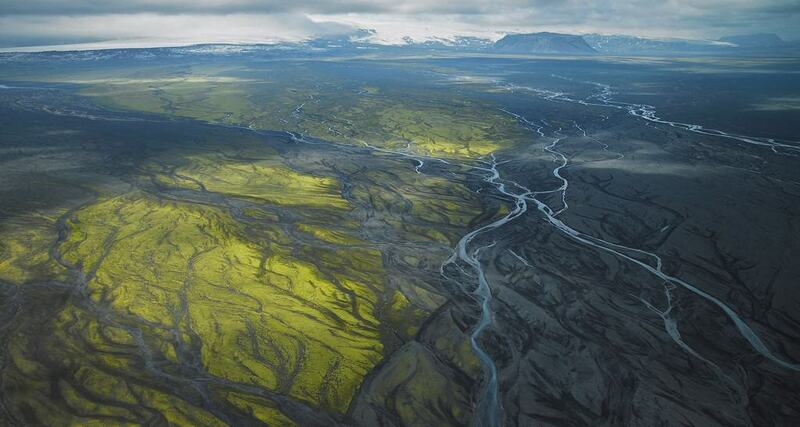 If you really want to get away from it all, the interior of Iceland is like nothing you have ever experienced before. The mountainous centre of the island, with its rocky deserts, jagged mountain peaks, ice caps, volcanoes, hidden valleys and hot springs, is an awe-inspiring and untouched wilderness. 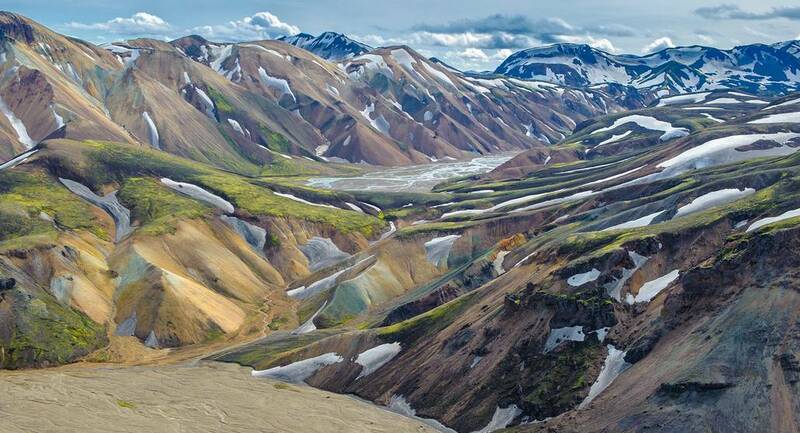 In the geothermal area of Landmannalaugar, nature has painted the rhyolite mountains in yellows, greens and reds interspersed with shiny black obsidian, and weary travellers can bathe in natural hot rivers. At Kverkfjöll, steam rising at the edge of the glacier has melted a series of bizarre ice caves. In the Dyngjufjöll range, the lake Öskjuvatn is situated in a large caldera (11 km2), and the crater Víti is filled with warm water. Both lakes were created in the wake of a gigantic eruption in 1875. The green, sheltered inland valley of Þórsmörk is a favourite with travellers, who use it as a base camp for hiking into the surrounding mountains. On the barren black sands of Sprengisandur, the arctic river beauty blooms bright magenta in August. For centuries the interior was all but inaccessible. Outlaws hid for years at a time in the highlands, rustling sheep and keeping away from law-abiding folk. Fortunately, access is a lot easier today. The interior is traversed by two mountain roads, via Kjölur and Sprengisandur, which only open in the summer months, after the spring thaw. Most highland routes involve crossing unbridged rivers, which should not be attempted without taking advice, and preferably travelling in convoy with other vehicles. Please note that if you rent a car, you cannot take it on a mountain road (classified F) unless it is a four-wheel-drive vehicle. But the wonders of the highlands can also be seen by scheduled bus or on organised tours, which run regularly across the interior on the Kjölur and Sprengisandur roads, as well as to such destinations as Þórsmörk, Landmannalaugar, Mt. Askja and Kverkfjöll. Hiking tours are offered to many of the most popular locations in the interior. And one of the most memorable ways to see the highlands is on horseback, riding into the wide-open spaces, far from all human habitation.